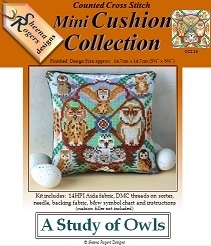 This mini cushion design is A Study of Owls and includes a range of these beautiful birds nestling in the trees, including Tawny, Snowy and Barn Owls, some baby Owlets with their mother, a nest of eggs and feather details down the edges of the design. Only whole cross stitch is needed to stitch this mini cushion, with a little backstitch required for the eye and beak details. This Owl themed mini cushion cross stitch kit includes: 14HPI white aida fabric, ready-sorted DMC stranded cotton threads on a card sorter, needle, backing fabric, b&w symbol chart and instructions (cushion filler not included).